Former football players at Highlands High School remember plodding down a steep hill on the south end of campus to practice on a barren patch of ground that they named Death Valley. All that changed several years ago. When a durable synthetic grass playing surface was installed on the football field behind the school, the Bluebirds began conducting their practice sessions there instead. But the area once known as Death Valley has been brought back to life. 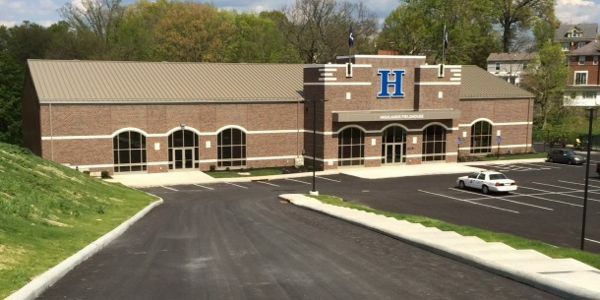 A building that includes a training center for Highlands sports teams and a maintenance garage was constructed in the valley as part of a $3.2 million school improvement project. The money was also used to convert an auxiliary gym in the high school building into a new fitness center and construction crews are currently remodeling the main gymnasium and locker rooms. The synthetic grass surface on the football playing field is also being replaced. Jerry Wissman, director of operations for Fort Thomas Independent Schools, said upgrading the high school athletic facilities is the fourth phase of improvements that began on campus in 2005. “First, we addressed our needs in all of the academic spaces and then we started addressing the athletic spaces,” Wissman said. Financing for the latest phase of improvements came from several different sources. In addition to offering bonds to local investors, Wissman said the school system received some state funds, grants from corporations, donations from area businesses and money raised by the Fort Thomas Education Foundation. St. Elizabeth Healthcare and Commonwealth Orthopedic donated money to help purchase weight training equipment for both the in-school fitness center and the new training facility for sports teams. The new building adjacent to the school gives student-athletes in all sports a bigger and better place to conduct workouts than the dark, cramped area in the school that had been used in the past. The new training center has stairs leading to a weight training area on a spacious balcony that overlooks a 30-yard synthetic turf indoor practice field. The field area is two stories high and large nets can be lowered from the ceiling to create a batting cage or enclosed areas to practice other sports. There’s also a studio on the first floor where cheerleaders and dance team members can practice their routines. 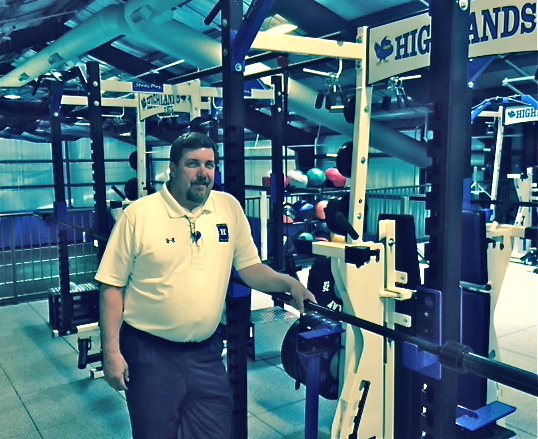 Wissman said the training facility is open to any athletic team at the school and the fitness center is already being used for physical education classes while the gym and football field are under construction. “To see the change in our PE (physical education) curriculum that this facility has brought is just fantastic,” Wissman said. Students can also purchase a $20 annual membership to use the in-school fitness area in the evening hours and during the summer. Faculty and staff memberships are free. Fort Thomas residents can buy an annual pass for $100 with the fee pro-rated according to how many months are remaining in the year. “What we’re trying to do is encourage our students and their families to pursue a lifetime of fitness,” Wissman said.